All male-line male descendants of the Ottoman dynasty had a right to the throne, and it was God alone acting through his baraka who designated the master of the “House of Osman”. The sultan was the keystone of the political system. His death could result in civil war; it overthrew the Empire, and the order of the world even. This had several consequences, including: ritualised secrecy surrounding the death of the sovereign, the “law of fratricide ”, and the progressive emergence as of the 17th century of the principle of seniority, accompanied by the ongoing desacralisation of the man who reigned (though without calling the legitimacy of the dynasty into question). Lastly, the deceased sultan was not a dead person like any other, and though his funeral rites were imperial, he was not always entitled to the respect due to all deceased Muslims. On the other hand, his death was bathed in a supernatural atmosphere and his body could be sacralised. Many accounts of the death of sultans have come down to us, most of which were written by Ottoman chroniclers. It is thus possible to have a good idea about the events, as well as about the mentalities and meaning of these deaths for the servants and subjects of the Porte. This forms the subject matter of this entry, and after having sketched out the nature of the sultan’s power, I shall examine the political consequences flowing from the death of the sovereign with reference to the “classical” period, before looking at the changes brought about by the crises of the 17th century I shall then analyse the imperial funerals from a political point of view, before briefly concluding on the moral and sacred meaning of these somewhat particular deaths. For though in dying the sultan became a Muslim like any other, his post-mortem fate, for better and for worse, was far from ordinary. The 19th-century – the century of “reforms” (Tanzimat) characterised by rapid political and social change – stands out so markedly from what went before that I have opted to limit my discussion to the period running from the 14th to the 18th century. 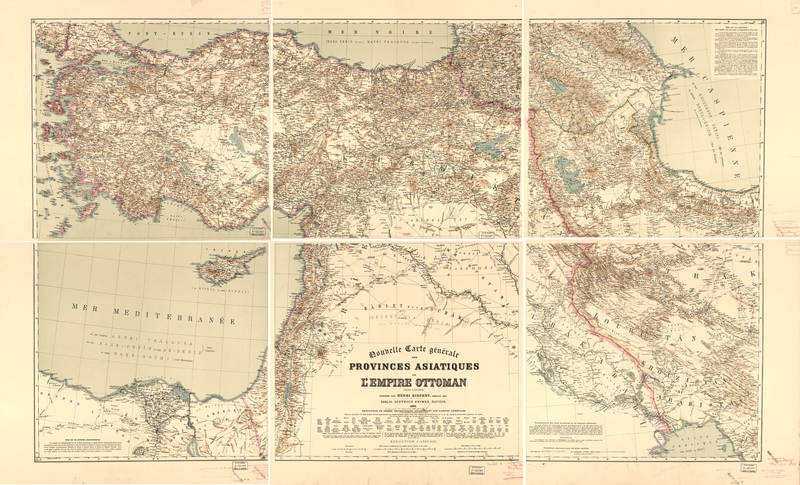 Map of the Ottoman Empire. Sultan Selim II (1524-1574)’s tomb (türbe). Up until the early 17th century nearly all the sultans died on the throne. Their death thus had political consequences, the nature of which was intimately bound up with that of the sovereign's power. The first point to be made is just how important the idea of dynasty was. The “House of Osman” (al-i Osman) had numerous “slaves” (kul), without any other ties, who were devoted to the head of the family and worked as the military and administrative cadres of the State, in which it may be compared to the Mamluk houses of mediaeval Egypt. But whereas these competed with each other, the Ottoman family did not and could not have any rivals. And far more importantly, from a very early stage it thought of its power and its territory as indivisible; there were no princely apanages to potentially precipitate the decomposition of the Empire. When in the late 15th century, in the midst of civil war, Prince Cem suggested to his brother Bayezid that they share the domains, this desperate move met with a predictably curt refusal. Ottoman history is thus the history of a dynasty. This is entirely normal for a multicultural, multi-ethnic, and multi-religious empire spreading over three continents, which, though it did develop a culture and civilisation that were common to its diverse populations, could only ultimately be defined in reference to its reigning family. The Ottomans knew that Westerners called them “Turks”, yet whilst the dynasty was Turkish (but also primarily Muslim) and spoke “Turkish” (türkçe), the Empire was that of the family of Osman. As for the Arabic, Armenian, Turkish and other populations, who were Christian, Muslim, and Jewish, they recognised the legitimacy of the dynasty, at least up until the late 18th century, and were predominantly loyal to it, even when they did revolt against the government, and against the sovereign even. This dynastic stability down through the centuries was obviously not unaffected by crises and changes. After a form of family co-management in an obscure early period, which can only be guessed at from the patchy posterior documentation, there followed a period when an all-powerful monarch tended to shut himself away in the solitude of a hidden god, before that of a devalued sovereign who represented the dynasty rather than himself. This final change, which started to emerge in the early 17th century, was partly the political consequence of certain royal deaths, a point to which I shall return later. It may already be pointed out, however, that this process characterising the second half of the Ottoman era was linked to the tentative inching towards a solution to a key essential problem, namely the absence of any automatic rule of succession to the throne. Indeed, whilst there was no legitimate form of contest with the “House of Osman”, the only way it could manage its “well-guarded territories” and its throng of subjects (reaya, literally “flocks”) was via a head of family who was master of the household and of the slaves. Yet in accordance with old Turko-Mongol traditions, all male male-line descendants had a right to the throne, and so when a sovereign died his uncles, brothers, sons, grandsons, nephews, and great-nephews could all legitimately contest it. Whoever won was legitimate, for his victory showed that he had the kut, a baraka that was divine in essence. It was, in short, up to God to choose the sovereign. This means of proceeding could trigger major crises and civil wars even. The Ottomans were aware of this. But for a long while they were unable to resign themselves to establishing a system of succession which would introduce a principle of automaticity and hence leave greater scope to the will of man, thereby denying God’s absolute power. It may be readily appreciated that a sovereign designated in this manner was far more than a mere head of government. “The sovereign has universal value”, Jean-Paul Roux wrote about the ancient and mediaeval Turks. “He is a microcosm; the happiness affecting him affects all his people, whilst the misfortune that befalls him rebounds on all his people. The texts clearly show us (at least in the inscriptions) that, from a very ancient period onwards, each time the qagan dies, the Turkish people die”1 . On this point the Ottomans were the heirs to the ancient Turks. On the death of Mehmed II in 1481, in the words of Ibn Kemal “the palace of the permanence of the world was in ruins and devastated, the pillars of the building were upended like ruins, and so the solid heart of the people of Islam and perhaps the firm spine of all humanity was broken”2 . And according to Selaniki, when Selim II, who had assumed the throne in Istanbul, finally reached the Army in Belgrade in 1566, the Grand Vizier exclaimed: “life has returned to our dead body!”3 . The sultan – even if a minor, even if mad (of which there were two cases) – even if deprived of real power, was the person who endowed the dynasty, the Empire, and the entire world with its meaning and significance, in which each being and each thing was to find their place in the harmonious whole, over which he presided by the sole fact of existing. The sultan underpinned the “order of the world” (nizam-ı alem), and was “the shadow of God on earth”, “the unique sun of the sultanate”. He knew all things, and everyone could call on him for justice. The “justice tower” of the Topkapı Palace in Istanbul, which dominated “the two seas and the two lands”, was the visible symbol of this. The sultan’s acts were his and his alone, be it a matter of appointing officials or concluding international treaties, and so when he died they had to be renewed. All public action ceased with his death; without him no order was possible. And when he died, the kapı kulları – the servants of the gate – no longer had a master. The metaphor of the keystone accurately conveys the symbolic importance of this position, for if the stone placed at the top of a copula is removed, the entire structure collapses. A 16th-century geomancer, in an account provided by Selaniki, employs a similar image when referring to the situation of Suleiman the Magnificent, who felt was near to death: “it is virtually excluded that the sick man shall recover his health, as if for example the pillar of the tent were broken and resting on a half pillar. A new pillar is brought and positioned so that the entire tent is firmly established”4 . The broken pillar and collapsed tent announced death in Anatolian folklore, but the words of this seer conveyed more than just ill omens, and saying too much led him to a sorry end, for the Grand Vizier had him tracked down and executed. The Coronation of Sultan Selim I and his portrait. Portrait of Suleiman the Magnificent. How did the kut granting this pre-eminent position to a member of the family actually transpire? In other words, what rite turned a prince into a sultan? It was called the cülus, the fact of sitting or being seated on the throne in the presence of dignitaries and a crowd of varying size. When in 1603 the notables arrived in front of the Gate of Felicity (separating the second courtyard of the Palace from the third, private courtyard) the first thing they saw was the throne; and when Ahmed I appeared – rather than his father, Mehmed III – this signalled without a shadow of doubt that it was he who was now sultan. In this instance it also meant that Mehmed III was dead. But characteristically, during a serious political crisis in 1687, the rebellious soldiers did not ask for Mehmed IV to be deposed, but for Suleiman II to be enthroned. This would turn him into the sultan, and thus only consequently would Mehmed lose his legitimacy. Equally in 1481, on the death of Mehmed II at a moment when his sons were far from the capital, İshak Paşa calmed the ensuing disorder by having Korkud – the young son of the future Bayezid II – ascend the throne. Everybody knew that this was only an interim measure; but whilst waiting for his father Bayezid to ascend in turn the throne at the Palace, Korkud was sultan by full right; and that was enough to restore order. A new pillar was holding up the tent, even though only a provisional one. 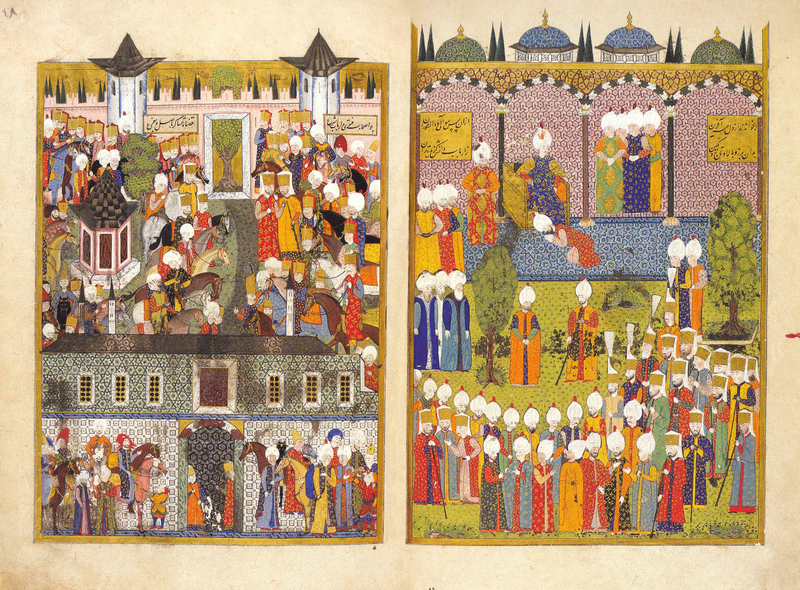 Enthronement of Süleiman the Magnificent. There were various other elements to the ceremonial. The main one was the beyat, by which ever larger numbers of dignitaries, following an ever more refined protocol, made an act of obedience to the new sultan once he had ascended the throne. To tell the truth, Colin Imber has shown that this ceremony was initially a ceremony of condolences and congratulations. But it ended up being an integral part of the enthronement rite, and acquiring a name invoking a pact between participants and sultan, who progressively became assimilated to a caliph5 . It could for that matter be repeated on any occasion, and over time intimate beyats preceding the cülus itself were introduced for the staff working in the private apartments of the palace. Similar considerations may be applied to the pilgrimage to the Ebu Eyyub mausoleum, more of which later. And so what ultimately counted was ascending the throne, the cülus, which alone revealed the kut and actually made a sovereign. A sultan could not be deposed; a sultan could not abdicate; it was the arrival of a new prince on the throne which brought about the change in reign, irrespective of whether or not the previous sovereign were dead. The context as just described led as a matter of course to a certain number of crisis elements when the sultan died. Prior even to his demise, the illness of the sovereign posed a serious political problem. The sultan, by his symbolic nature, had to be visibly strong. For that matter any weakness was sufficient reason for replacing him, a new cülus sufficing for him to lose his status. This would appear to have been the fate of Osman, the eponymous founder of the dynasty, and was no doubt the argument that enabled Selim I to ascend the throne in 1512, with the forced consent of his father Bayezid II: “Our padichah is old and sick, we want Selim in his place”, the janissaries declaimed6 . Suleiman the magnificent, fearing he might meet a similar fate, eliminated his son Mustafa, who was suspected of plotting against him. Thus the reigning sultan needed to display his vigour, preferably riding on a feisty stallion even when illness should have precluded his so doing. Suleiman paraded on horseback at each halt during his final and fatal campaign, despite being exhausted. Two centuries later, in 1757, Mahmud I forced himself to go on horseback to attend Friday prayers, even though the political significance of the sultan had been immensely reduced by this time. It was beyond his strength; he died on the way back. It was thus important to conceal illness and present a sovereign who was seemingly in good health – or else on the contrary to conceal him, should his state preclude displaying a reassuring countenance. This was the case with Mehmed II in 1481 and Selim I in 1520, when they travelled tucked away in their carriages. Henceforth it was no longer the illness that was concealed, but how serious it was. Still, one way of displaying that the affairs of State continued to function properly under the control of the sovereign was to organise councils (divan) and to run affairs as if nothing was amiss. The secrecy surrounding the illness of the sultan was only a prelude to that surrounding his death. The symbolic necessity of such an attitude is obvious, given the sovereign’s cosmic status. As we have already seen, if there were not a member of the ruling family sitting on the throne, then the universe was upended and nobody had the authority to re-establish order by issuing firmans. Things only returned to their normal course, or more accurately their course only became possible once again, once the new sultan had been enthroned. Yet up until the late 16th century the new sultan was nearly always absent, irrespective of whether the death took place in the Palace in Istanbul, or elsewhere, during campaigns. In 1566 it took forty or so days for the news of his father's death on the Hungarian front to reach Selim II in the Anatolian province he governed, and for him to make a detour via Istanbul to be enthroned, before then presenting himself in Belgrade as the reigning sultan and praying before his father’s dead body. More material requirements made secrecy necessary, starting with the risk of civil war. The mode of succession as described above meant there was a constant risk of internal conflict in the event of the real or supposed weakening of power, especially when the sultan was elderly. The capture of Bayezid I by Tamerlane in 1402 and his subsequent death in captivity sparked a conflict between his sons that lasted for a decade and inflicted lasting trauma on the Ottomans, who subsequently became extremely attached to good order and civil peace. This did not prevent a military and political crisis at the end of Bayezid II’s reign, not only between his heirs but also opposing him to his son Selim. Suleiman too, towards the end of his reign, had to put an end to the opposition between his two remaining sons by providing armed support for Selim, against Bayezid, who on being defeated fled to Safavid Iran, whence he was finally handed over and executed. The death of the sultan could a fortiori trigger civil war between his heirs, sometimes fomented by enemies. Shortly after Murad II acceded to the throne in 1421, the Byzantine Emperor backed armed opposition being waged by his brothers, and thirty years later imprudently threatened young Mehmed II with similar treatment. When the latter died in 1481, his sons Bayezid and Cem entered into armed conflict, ending with the defeat of Cem, who fled to Rhodes, before dying in Rome in 1495, a hostage of the Western Christian powers and a threat that Bayezid II could ill afford to neglect. 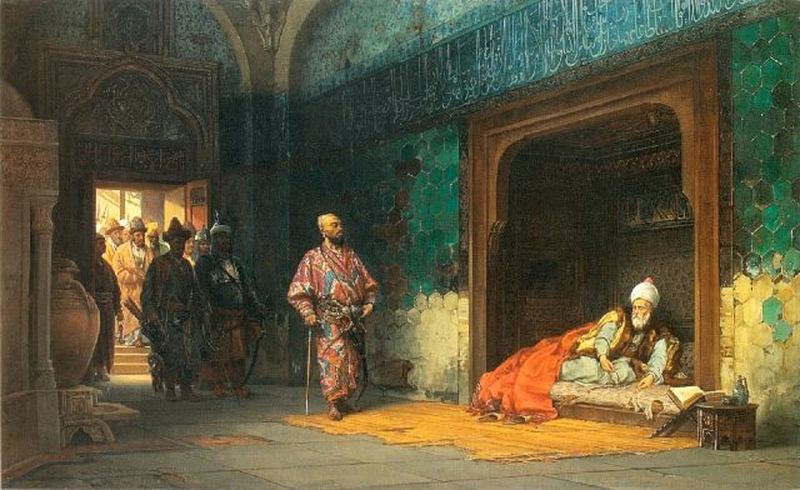 Sultan Bayezid as Tamerlan’s captive. The way political and military power was organised also engendered another recurrent fear. The kuls of the House of Osman were the slaves of the head of the family, in other words of the reigning sultan and him alone. In theory in any case they had no other bond of any sort, and once the master died they no longer owed anyone anything. It was thus to be feared that the janissaries and cavalry troops of the Porte might cause very serious disorder. Admittedly this fear only crystallised once, on the death of Mehmed II in 1481, under what were unusual circumstances, for the men were furious that the death of the sultan had been concealed from them, partly due to political reasons. Grand Vizier Karamani Mehmed Paşa was suspected of favouring Prince Cem, whereas the troops tended to be in favour of Bayezid, and in any case the vizier had chosen to inform the two princes as soon as possible. Be that as it may, the men assassinated the vizier and sacked the capital. They only calmed down, it will be remembered, when Korkud, son of Bayezid II, took the throne whilst waiting for the latter to be able to take the throne himself. Such a situation did not arise again. The precautions taken on the death of Murad III and Mehmed III in the second half of the 16th century were designed to counter other dangerous circles, whilst the janissaries for their part subsequently revolted on more than one occasion, without any need for the sovereign to die first. But the 1481 precedent remained in people’s minds, and influenced the decisions of those who subsequently had to manage these difficult episodes. There was no doubt also another reason for secrecy – the fear that the enemy might be tempted to take advantage of the situation. This concern was mentioned by the Greek chronicler Doukas with regard to the death of Mehmed I (1421) and Murad II (1451). It was clearly expressed by Feridun (in what is a first-hand account, since he was private secretary to the grand vizier) regarding the death of Suleiman during the siege of Szigetvár in 1566, and it also dictated the behaviour of Grand Vizier Koca Sinan Paşa on the Hungarian front when the death of Murad III was announced in 1595. Lastly, of course, controlling the secret could bring political advantage. It is thus not surprising that on the death of Murad III, the queen mother and the authorities of the Harem alerted the heir, Mehmed, whilst being careful that the vizier and other members of the divan should remain in the dark, though they soon learned the news by their own means. This is not the place to go into the details of the techniques used to maintain secrecy. It was firstly a matter of hiding the body, a point I shall return to later. Otherwise the principle was to act as usual, as if everything was normal, as was also the case while the sovereign lay dying. Displaying the gravity of the illness could be used as a blind, with the to-ing and fro-ing of doctors and medications endeavouring to prove that since the sultan was receiving treatment, he must therefore be alive. Councils were held during which decisions were taken relating to what interests mankind above all else, namely gratifications and nominations, and this implied issuing documents that were in fact fakes. Thus one of the first acts of Selim II on becoming sultan was to endorse all the acts issued in the name of his deceased father. The ceremonies demanded by the calendar had to be organised as usual, such as the birthday of the Prophet (Mevlud) in the Szigetvár camp in 1566. This could go as far as macabre pantomimes – moving the hand of the corpse of Mehmed I to make it look like he was alive, placing a man in the mortuary carriage of Suleiman in order to move the dead sultan’s turban, as if he were nodding in greeting – not to mention the use of doppelgangers. The measures taken by Grand Vizier Sokollu Mehmed Paşa on Suleiman’s death were a riot of ingenuity. It could be tempting to view them as the work of chroniclers. 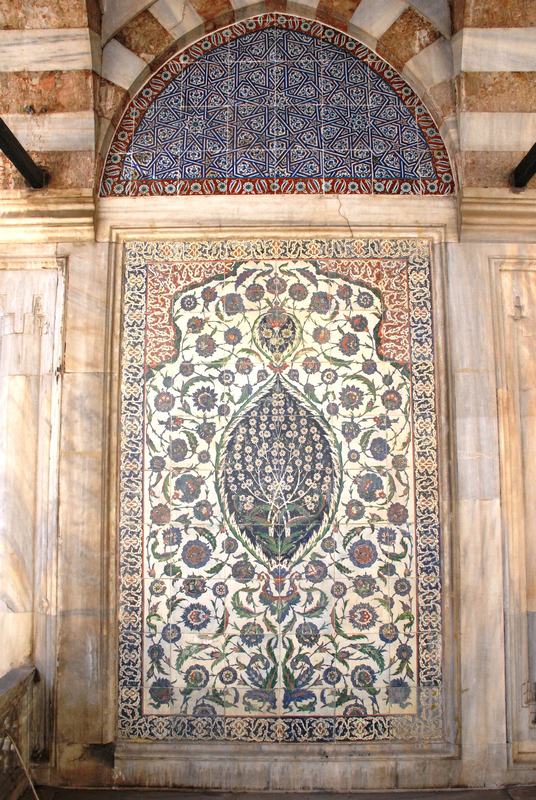 But besides the fact that the chroniclers concerned, Selaniki and Feridun, were well-informed first-hand witnesses, the archives of the Topkapı Palace contain a note attributable to the grand vizier, in which he envisages holding the Mevlud, and the need to distribute confectionery to the troops, as well as having boots made to fool people into believing that the sultan, who was already dead by this stage, was in fact wintering in Buda. Hence there was always a good reason to keep the sovereign’s death a secret, and a thousand ways of doing so. Still, no secret was so well guarded as to never come to light. Just as the viziers of Murad III learned of his death, albeit slightly after the event, so the atmosphere in Suleiman's camp soon raised the men’s doubts – as the seer’s incautious prognosis shows and Selaniki clearly states – which soon turned to certainty once news arrived from the capital. And so when the grand vizier, reassured that Selim II would shortly arrive, announced the death, thereby triggering sudden ritual displays of mourning, “truly, there was nobody left who did not know that the deceased was dead”7 . In other words the troops had come to share the secret, and helped to maintain it by their apparent credulity. Was this a sign of self-control, in an attempt to avoid a repeat of the dramas of 1481 ? Perhaps it was. But writing that the soldiers “did not feel it suitable to divulge the secret”8 suggests that this secret, which was now interiorized, had become a rite. Whilst the ritualisation of the secret could help avoid violence arising from the crisis triggered by the sultan’s death, there was still a high risk of civil war, for the Ottomans felt it inconceivable to deny the divine nature of the choice of sovereign. An original solution was found to this problem, known as the “law of fratricide”. A sultan could in all justice sentence a prince guilty of rebellion to death – and Suleiman provides us with two examples of this. But fratricide, consisting in the systematic elimination of all potential rivals to the new sovereign other than his sons, was more awkward to justify, with the idea that the common good may justify a private evil tending to be invoked. Murad I had his brother’s son put to death on conquering the town of Biga, where he was found. The first application presented as such by the chroniclers took place on the battlefield of Kosovo, in 1389, to the benefit of Bayezid I, whom certain authors exonerate by arguing that he was not the instigator of the act. At this stage it is not yet an automatic practice, for Murad II merely blinded his brothers, a practice copied from the Byzantines. Mehmed II, on the other hand, eliminated his only remaining brother, an infant. Six months after acceding to the throne, Bayezid II, caught up in a struggle with his brother Cem, discreetly had the latter's son killed. However, the same Bayezid, on being succeeded by Selim I, got the latter to agree to spare his (Selim’s) brothers and nephews. Despite his attempts to respect this promise, the political situation led Selim to eliminate all of them, even those who had pledged loyalty. Henceforth fratricide, though a hateful rule, was recognised as inevitable. Suleiman – an only son – was spared the practice, yet during his reign it was spoken of as wholly natural. Nor did Selim II have any rival in 1566. But the accession to the throne of Murad III and Mehmed III in 1574 and 1595 respectively saw the systematic execution of their brothers. These killings, regarded as intolerable by the population and sovereign, were legal. They were justified by the “law” of fratricide, enshrined in a text presenting all the characteristics of a fatwa to be found in the Code of Mehmed II – but in all likelihood interpolated at a later date, probably at the beginning of the reign of Suleiman, who could thereby justify the acts of his terrible father, whilst making the path easier for his own successors. Süleiman the Magnificent's interior mosque. By the late 16th century a certain balance had thus been found, making it possible – albeit using morally intolerable practices – to ensure the transmission of the throne without a major political crisis ensuing, whilst safeguarding the underpinnings of Ottoman legitimacy. The radical effects of fratricide were complemented by the progressive dropping of the practice of sending princes to the provinces, meaning they were now available in the Palace. Henceforth the death of a sovereign no longer occasioned a major crisis, as not only was competition now impossible, but there was no longer any reason to keep the death secret for days or weeks at a time. A good illustration of this new state of affairs may be afforded by the events narrated earlier surrounding the enthronement of Ahmed I in 1603, a fait accompli signalling to the dignitaries both that the old sultan was dead and that the new one was in place. Yet these same measures progressively brought about a complete modification in the balance of power and the Ottoman system of succession. It needs to be remembered that in 1603 Ahmed I was a thirteen-year-old child. As a precaution, and in order to avoid risking the demise of the dynasty – or else because he was deemed too young to order a political murder – his uncle Mustafa was allowed to live. On Ahmed I’s death, in 1617, there was thus a choice to be made between princes from two different generations, all present in the Palace. Ahmed I’s eldest son, Osman, was only thirteen, and so Mustafa was chosen. It may be held that irrespective of the process adopted, the prince who arrived on the throne was the one to enjoy the divine kut. Yet in 1617 it was clear that it was men, not God, who were making as rational a choice as possible. The decision was in the hands of dignitaries referred to as “those who bind and unbind”, a term in classical Muslim law designating those qualified to elect a caliph or imam. The expression is not without substance, since a few decades later these same dignitaries, evoking the qualities required of a candidate, deemed they were entitled to judge the legitimacy of Ibrahim’s reign. Irrespective of this gradual assimilation of the Ottoman sultanate to a caliphate, which only really took form considerably later, it was now most definitely men who made a sultan, not God. A few months later, in February 1618, the mental disorder of Mustafa I obliged the dignitaries to replace him with the young Osman II, who proved unpopular. This provoked the janissaries into rebellion, as a consequence of which Mustafa returned to the throne in May 1622, despite the misgivings of the ulemas. But in July 1623 his manifest insanity led “those who bind and unbind” to justify the enthronement of yet another sultan, Murad IV, the son of Ahmed I and brother of Osman II. When Murad died on the throne in 1640, this occasioned discussion and somewhat obscure choices involving the ulemas, the grand vizier, and the queen mother, and Ibrahim, the oldest of the living princes, was designated. He was later replaced by the eldest of the princes, Mehmed IV. Seniority progressively became established, and this simple dynastic system, which lasted until the end of the Empire, meant that the role of “those who bind and unbind” receded before finally disappearing. Henceforth, to draw on an expression used earlier and expand on it in the light of this new context, the death of a reigning sovereign no longer occasioned in itself a major political crisis. Besides, as of the 17th century numerous successions, far from causing a crisis, were in fact the consequence of one, leading to the sovereign being deposed, and on occasions executed via the application – be it conscious or otherwise – of the principle of fratricide. For this was never wholly abandoned. Selim III fell victim to it in 1808, when his successor Mustafa IV feared for his throne, and a few months later Mahmud II applied it to Mustafa IV, partly as a matter of justice but probably also as a precaution. It may thus be considered that the death of sultans ceased to be a major political issue as of the 17th century, and consequently that no more needs to be said. Nevertheless, the deaths of two deposed sultans in the first half of the 17th century played a significant role in the evolution of the regime. 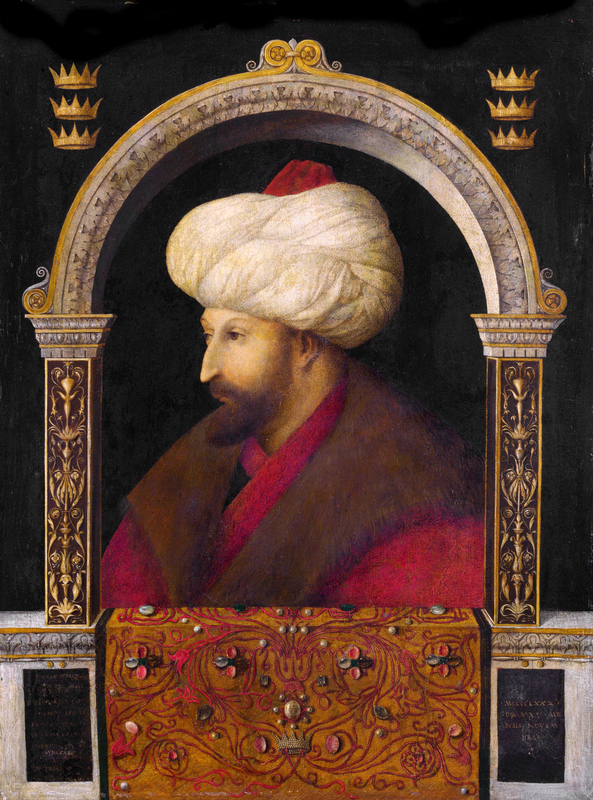 Portrait of Sultan Selim II. Portrait of Sultan Selim III by Kostantin Kapidagli. On 19 May 1622 a revolt by the janissaries ended in a coup d’état. Osman II had lost the sympathy of the kuls though his policies and his clumsiness. Poor handling of the crisis, which initially posed no threat to the sultan remaining on the throne, resulted in men invading the Palace, initially with reverential fear, before then entering the private area they were not allowed to access. Perhaps under the manipulation of Mustafa I’s son-in-law, Davud Paşa, who went on to obtain the position of grand vizier after these events, they called for Mustafa and then took him out over the rooftops, sat him on the throne, and obliged the reluctant ulemas to pledge obedience to this feeble-minded individual. A taboo had been lifted. Although Bayezid II had been deposed at the wish of the janissaries in 1512, this had been done with tact, and the fallen sovereign treated with respect. Above all it had remained a family affair, since it was his son Selim who had been behind the manoeuvre. The situation in 1622 was entirely different, since it was a revolution conducted by soldiers who, in their boldness and in a state of great confusion, went further than they no doubt intended. Osman II, desperately seeking to re-establish his position, left the Palace in disguise and went and harangued the janissaries in their barracks. This act, which failed, was already a sign of his fall. The pace of events now quickened. The unfortunate Osman, after being treated roughly by the crowd and arrested, was finally assassinated by a few henchmen working for Davud Pasa, against the will of the majority of the rebels and without their knowledge. The details are horrendous. As the young man defended himself with great force, his testicles were crushed. The murder was compounded by molestation, and then to prove that Osman had been eliminated, his ears were cut off and sent to the queen mother. This accumulation of crimes of lèse-majesté – none of which had ever taken place before – marked a break in the history of the dynasty. The dynasty was never called into question, but the extraordinary status of the man who was sultan was now a thing of the past. It was not only “those who bind and unbind”, but even a crowd in revolt who could demand and obtain his downfall. It was even possible to kill him. A few decades later, in 1648, when the deposing of Ibrahim seemed to be causing potentially dangerous unrest, it was “those who bind and unbind” who felt themselves legally authorised to sentence the deposed sultan to death, on the basis of an ad hoc fatwa. But not everyone felt this was normal; the executioner fled, seized with holy terror at the thought of the deed awaiting him; the grand vizier had to force him to carry out his task. The law thus prevailed – the law of men. Sultan Osman II (1618-1622) with his vizir Davud Pasha. It is true that similar events did not occur again. But they had considerable consequences on mentalities. Even if there was subsequently more than one sultan, especially in the 19th century, who turned out to be a strong man, they were all aware that the rules of the game had changed. An increasing number of sultans were removed from the throne, and they went along with it. Just like their kuls and their subjects, they took due note of the irremediable desacralisation of the person of the sovereign. No doubt many other factors contributed to the political and social changes affecting the Ottoman Empire over the last three centuries of its existence. But the ignominious death of Osman II and the legal execution of Ibrahim had immense consequences. In death, the sultan was a Muslim like any other, and his funeral was like anyone else’s. His body was washed and placed in a shroud by his relatives, taken to outside a mosque for the funeral prayer (namaz), before being taken to its final resting place in a procession, with his sons and relatives acting as pallbearers. Burial in a mausoleum had long been a widespread practice in Ottoman society, even though it was debatable in strict orthodoxy. The sultans were thus laid to rest beneath a cupola. There was nothing exceptional about any of this. Yet the status of the sovereign was not without consequences for his funeral. Suleiman the Magnificent's remains brought back to Istanbul. A fundamental question was that of the time that could elapse between death and burial. In Islam the rule is to bury the body as soon as possible, and the Ottomans followed it as best they could. But for a long while this was not the case for their sovereigns. During the 1481 crisis Mehmed II’s body even lay forgotten for three days, before the smell and human respect reminded the living of their duty. Paradoxically the very nature of the all-powerful sultan meant that he did not receive the care due on dying to the most humble of Muslims. Mehmed II’s case was exceptional, at least for a while. For as of the death of Selim II, the washing of the body was apparently only carried out once the new sultan had been enthroned. It is true that the lapse of time was very short if the latter were in the Palace. But this was not the case on the death of Selim II and of Murad III. They were thus refused the right, due to all Muslims, of being washed immediately on dying. As for burial, up until the late 16th century most sultans had to wait a long while for it. They could not be buried just anywhere. Until the conquest of Constantinople, and even after the true seat of power had shifted to Adrianople (Edirne), it was deemed fitting that members of the dynasty be buried in Bursa, the first capital, in an imperial necropolis known as the Muradiye. Subsequently the sovereigns (and after Suleiman their family) had their tomb in Istanbul. 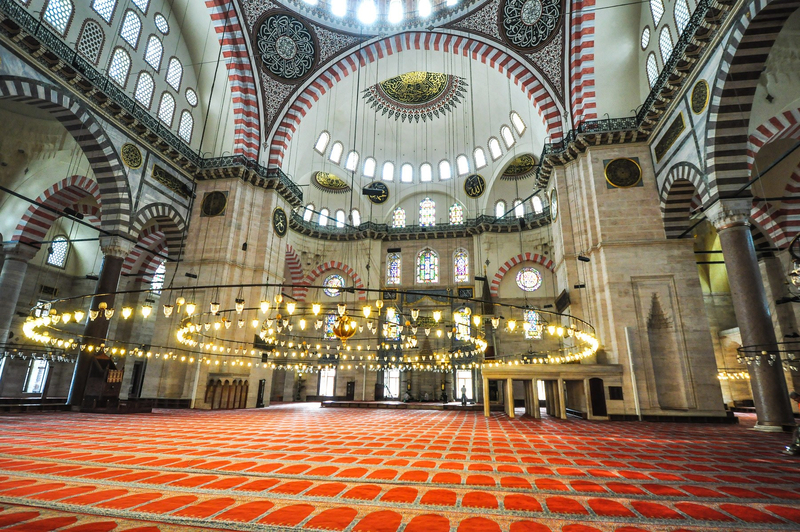 It was a way of proclaiming for all time that these cities belonged to the Ottomans and to Islam. Yet up until Selim II, few died when in Istanbul, and so a certain amount of time was needed to transfer the body. Far more importantly, the practice of secrecy implied a considerable delay, as in the case of Suleiman. This led to several disagreeable material considerations – the decomposition of the body, the smell – that had to be resolved using methods that ran counter to Muslim propriety to varying degrees. Apparently Osman I and most certainly Selim I and Suleiman were buried provisionally before being transferred, even though this practice, tolerated under certain conditions by the Hanbali and Maliki schools of law, was forbidden by the Hanafi school that the Ottomans were meant to follow. Unpleasant measures were employed to try to delay decomposition and prevent stench. It has been suggested that Murad I, Mehmed I, and Suleiman were eviscerated, and their entrails buried separately at the place where they had died. Islam normally rejects such practices. It was not totally precluded within the mediaeval Ottoman context, but this seems most unlikely. 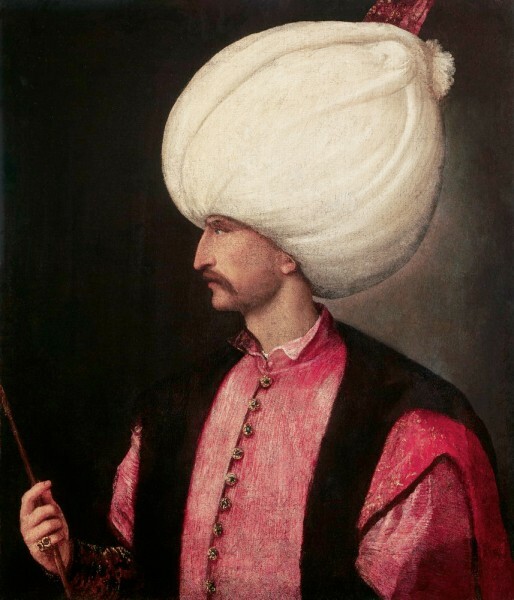 With regard to Suleiman, in any case, everything suggests he was probably lightly embalmed, using enemas, excessive quantities of perfume, and oiled fabrics. Accounts of the funeral of Suleiman II, whose body was transferred from Adrianople to Istanbul in 1691, mention the same products. In 1574 Selim II’s body was conserved in ice until the arrival of Murad III. The body was thus not opened up, as far as we can tell, but underwent rather inglorious manipulations that would not have been inflicted upon the average Muslim. The choice of burial place was also determined by political necessities transcending any individual considerations. For a long while sovereigns were as a matter of course buried in the first capital. It was no doubt the wish of Mehmed II to lie in the new capital, the conquest of which formed the basis of his glory. But the decision, which was political in nature, lay with his successor. Besides, up until Suleiman the imperial mausoleums – adjoining the great mosques, to which they formed modest annexes – were only built a certain time after the burial, and on the order of the reigning sultan, with the tomb remaining beneath a funereal tent, apparently until the lifting of mourning. These imperial mosques forming the Istanbul skyline served to celebrate the glory of the dynasty, just as their pious founders did. 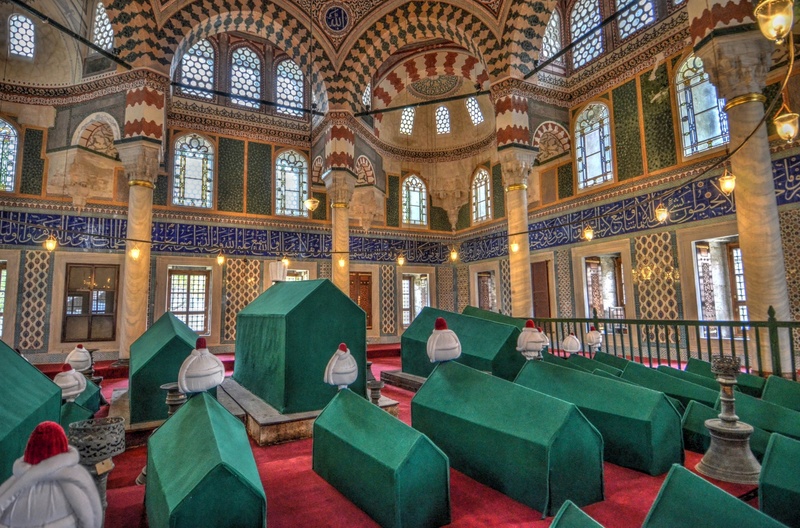 Given such an obligation, it was not possible to fulfil Bayezid II’s express wish to be buried ad sanctos, near the revered tomb of Ebu Eyyub, outside Istanbul, and Selim I instead had him buried in town, behind his mosque. The mausoleum of Selim II, who died in 1574 without having built a mosque in the capital, lies near Sancta Sophia (that he restored). It was a particularly holy and imperial site. Still, he was the first sultan not to be laid to rest in his mosque. Subsequently, in 1595, and then again in 1603, the same place was chosen for Murad III and Mehmed III. This was the beginning of an imperial necropolis, near the Palace, with mausoleums that were no longer humbly placed behind the prayer wall of a mosque, but, as Gülrü Necipoglu-Kafadar observes9 , turned towards the Hippodrome and the Divan Yolu, the avenue used for great imperial processions. In 1617 Ahmed I, the founder of the Blue Mosque complex, had his own mausoleum, but positioned along the same axis. This tendency became accentuated after the Osman II drama in 1622. An imperial tomb was needed for him, but it had to be discreet, and given the ambient disorder there was no question of leaving him to rest beneath a tent while waiting for a mausoleum to be erected. He was thus buried in his father's mausoleum. It subsequently became customary to bury sultans in the mausoleums of sovereigns, and even in that of a queen mother, Turhan Sultan. The reasons underpinning the particular choices are a matter of debate. It may also be noted that in the late 18th century an attempt was made to resurrect the majesty of the sultanate, combined with a tendency to cluster around the family unit, a phenomenon that affected Ottoman society more generally. But quite clearly a dynastic rationale progressively took hold, exalting the reigning family whilst casting down the individual. It would be fastidious to go into the details of the changes in protocol affecting the various phases of funerals. Nevertheless, it is worth mentioning the part that the new sultan now played in the public funeral prayer and in the procession bearing the deceased to their place of burial. The funeral prayer is an obligation incumbent upon the Muslim community. It is thus a public rite. The same was true for sovereigns. When the bodies of Selim I and Suleiman arrived, the entire populace of Istanbul was there, together with the dignitaries, to accompany them to outside the mosque where the rite took place. The political importance of the capital is emphasised by the fact that whilst an initial funeral prayer had been conducted for Suleiman in Belgrade, a second was held in front of the Istanbul mosque, even though this practice was condemned by Hanafi legal scholars. The body was welcomed at the gates of the capital by the sovereign on horseback, before being borne aloft and carried inside the town that the dynasty had conquered, in a ceremony that was designed to recall this legitimising victory, a rite in which it was only normal that the dutiful people take part. From Selim II onwards, who died in the Palace, the prayer was conducted in the public parts of the building, but in the presence of numerous dignitaries and not far from the throng of subjects. Up until 1481 new sultans who were not present in Brousse were unable to accompany their father to his final resting place after the prayer. But on the death of Mehmed II, the pious Bayezid II took part in the procession, not as a king but as a dutiful son, acting as pallbearer for his father's coffin. It is known that he in turn was taken to his tomb by his son Selim I in person. 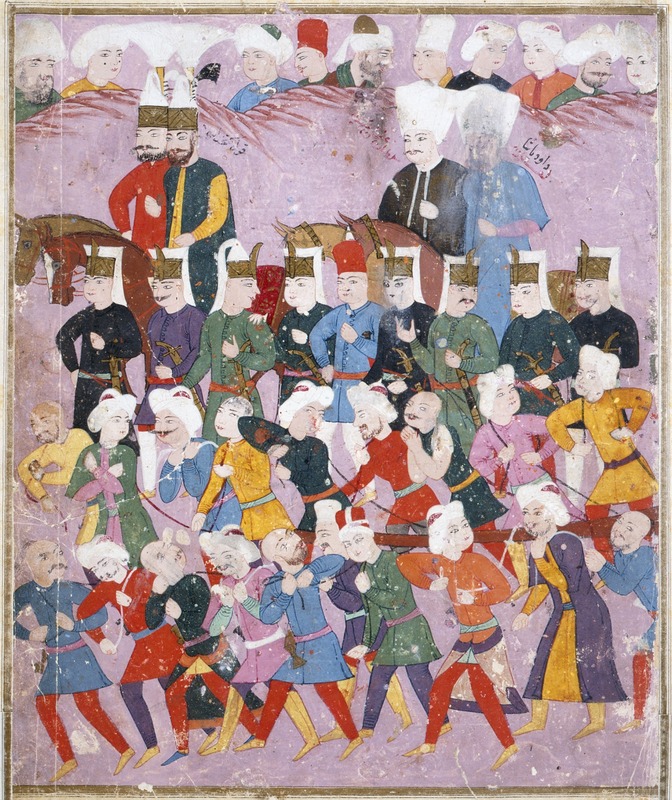 Suleiman followed his father's procession on foot in 1520. The protocol evolved in 1566 when Selim II, after attending the prayer for his father in Belgrade, took his time – deliberately, one may suppose – to return to the banks of the Golden Horn, and so did not attend the second prayer, the procession, or the burial. It is hard not to perceive the attitude adopted by this great creator of rites as indicative of the tendency for sultans to withdraw, a trend which only increased over time. It is for that matter remarkable that the departure of the convoy bearing Suleiman's body to Istanbul imitated a funeral procession and burial, in the absence of Selim II. 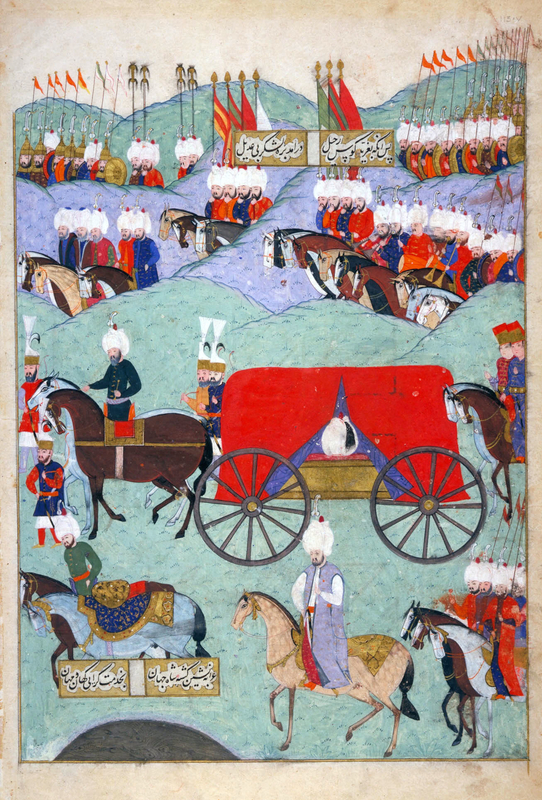 The dignitaries positioned themselves in front of the wagon and saluted as if the dead sultan were still alive, then accompanied him for a few hundred yards (a funeral procession), stopped to recite the fatiha for the soul of the departed (a burial), before returning towards the Imperial tents where Selim II received them, still in mourning. This final detail would appear to militate against the hypothesis put forward by Gülrü Necipoglu-Kafadar that there was a fear that the living sultan might be contaminated by death10 . Instead one may perhaps wonder whether Selim II felt that physical presence of his defunct father, as long as he remained unburied, might be detrimental to the principle of monarchy, even though there was no doubt about the reality and legitimacy of his reign. Be that as it may, it henceforth became the rule that the new sultan, after attending the prayer, returned to his apartments. 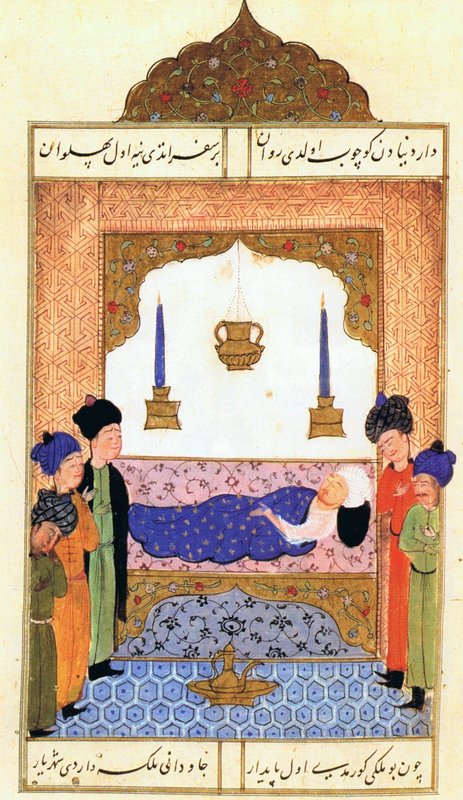 Selim I on his deathbed, 16th century, Selīm-nāme, Topkapi Palace Museum, Hazine 1597-8, f. 267a. One final element of the funeral rites needs discussing, and that is the issue of mourning. Other than in scale, this barely differed from that for common Muslims. Mourning was marked by often spectacular gestural displays, which tended to become increasingly discreet over time, thus better complying with the precepts of religion and good taste. It was also marked by vestimentary practices. A Western account of Mehmed II’s funeral refers to a pageant of black. Here once again a sense of measure gradually took hold, and the use of modest forms of dress came to be the norm, together with a veil – black, mauve, or dark green if we are to believe the depictions on miniatures – wrapped around the dignitaries’ turbans. An important point relates to the reigning sultan. For a long while he openly displayed his mourning. But a striking change took place with the advent of Murad III in 1595, who presented himself in mourning for his enthronement, but as soon as he thereby became the legitimate sovereign, returned to his apartments and re-emerged wearing a short jacket made from violet-coloured velvet. It was a tasteful form of dress, but no longer one of mourning. Mehmed III followed this example. Henceforth it was the son in mourning who came to the throne, but the sultan in majesty, whose presence alone sufficed to give life once again to the world ruined by his father's death, who attended the funeral service of he who was no longer the sovereign. Besides, mourning dress gradually lost its significance in court, no doubt both due to the progressive depreciation of the person of sovereign, and the increasing desire to respect orthodox sobriety. 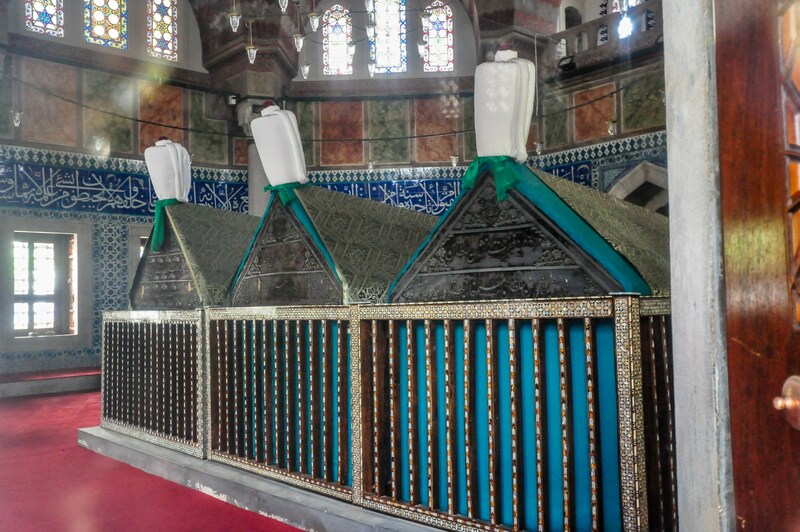 The cenotaphs inside Suleiman's Türbe (grave). Before finishing this account, that has focused primarily on political issues and insisted on the slow but steady desacralisation of Ottoman sovereigns, the death of sultans will now briefly be examined from another point of view. An Ottoman sovereign, after all, was not an ordinary man, and his demise was bathed in a supernatural atmosphere marked by numerous signs, whether the sultan appreciated them or not. These included announcements by holy dervishes, inspirations sparked by troubling divine manifestations, premonitory dreams, the predictions of seers (such as the geomancer referred to at the beginning of this entry), together with astronomical and meteorological phenomena. Changes may be noted for that matter. Insolent dervishes gave way to learned astrologers. Especially, the premonitory signs, which had long been individual, became far more general in the 17th century, for it was nature in its entirety which was speaking, and the omens no doubt concerned the Empire more than the man who reigned over it. Equally, because the sovereign was unique, his death occasioned speeches and intellectual and political constructs. It is thus not surprising to see the sultan attributed an exemplary death. Murad I, who was assassinated on the battlefield of Kosovo in 1389, became a şehid, a martyr who died fighting for the faith. His successors, without perhaps benefiting from such supreme divine favour, died as gazis, champions of the faith. More generally, up until the end of the period covered by this account, the sultans forced themselves to fulfil their function as a king up until the very end, despite their pain and suffering. Their death was thus exemplary. It was also true from a religious and moral point of view. The long account of the death of Selim I is an edifying moral tale describing a good Muslim death, in full conformity with the manuals, even though there was more than a whiff of sulphur about him. With the change in mentalities, and come the 17th century the increasing number of sultans to be deposed, there are fewer descriptions, and a shift in tone. More place is accorded to the suffering, tears, and emotive effusions of the dying man and his relatives. The sultan was no longer an epic hero, but a fellow creature suffering with dignity. But on dying the sultan became far more than just that. For a start it may be recalled that the very place of his burial made him a key element for reaffirming the legitimacy of the dynasty. More importantly than this, there could even be something divine within his body itself. What amounted to a popular cult sprang up around the tomb of Bayezid II. It is true that the ulemas looked unfavourably upon the sanctification of this sultan, with his sympathy for dervishes. Yet in 1566 Grand Vizier Sokollu Mehmed Paşa, left to his own devices whilst awaiting the arrival of Selim II, and obliged to emit fake documents in the name of the departed, drew what was clearly sincere comfort and reassurance from the presence of Suleiman’s corpse, above which he had notes placed, fictitiously asking the sovereign’s opinion: “the note remained for an hour on the throne, and the right answer having been solicited from His Majesty God who grants favours, thanks to the benediction of the spiritual influence of the departed, the confidant of the secret in charge of writing the answer penned [the] acceptance or refusal which appeared on the tablet of his conscience, and sent it forth”11 . The holy nature of the body of the departed comes across clearly on reading the account provided by Feridun, the grand vizier’s right-hand man. In fact it is known that living sultans frequently went on pilgrimages to their ancestors’ tombs in order to have the baraka and martial valour bestowed upon them. This was the purpose of the famous pilgrimage to the mausoleum of Ebu Eyyub, in Eyüp, at the inland tip of the Golden Horn. The origin of this dates back to Selim I who, on setting off on campaign in 1514, went to pray on the tomb of this companion of the Prophet, who had fallen outside the Byzantine town, before returning overland to the Palace, making a pilgrimage to the mausoleums of his father and grandfather along the way. This practice of preceding a campaign with an imperial pilgrimage to Eyüp, returning to the city via the Adrianople Gate (Edirne Kapı) so as to visit the tombs of the departed sultans, was to a certain extent an imitation of Mehmed II’s entry into the conquered city. This ceremony lasted throughout the 16th century. It was performed by Selim II after his enthronement, who then set off for the front, and it ended up progressively becoming an essential part of the protocol for the investiture of sultans. This rite, which was still in practice in the early 20th century, was the unwitting perpetuation of a magic cult rooted in the holy nature of the sultan’s body. This exposé has been deliberately descriptive, and does not call for an extensive conclusion. I will just point out the extent to which the particular place occupied by the sovereign within the Ottoman political system meant his death was an exceptional moment. This was in part due to the void it created, but also because it mobilised all of Ottoman society, thus illustrating its main characteristics and how these changed over time. The account of these exemplary deaths over the course of six centuries brings out how the monarchy came to assert itself, revealing the unique place accorded to a hero-sovereign, followed by the gradual desacralisation of the sultan in conjunction with the political upheavals of the 17th and 18th centuries. What also transpires is how dynastic legitimacy was safeguarded by the very process of bringing the sovereign back down to a more human scale. Finally, it shows the ever increasing tendency across society to adopt an orthodox and dignified form of Islam. What the accounts of the chroniclers also reveal is the attitude the Ottomans adopted towards death, and the advent of a sensibility that granted all due place to the suffering of the individual. Jean-Paul Roux, La Mort chez les peuples altaïques anciens et médiévaux d’après les documents écrits, Paris, A. Maisonneuve, 1963, p. 35. Kemalpaşazade, Tevârih-i âl-i Osmân. Defter VII (éd. Şerafettin Turan), Ankara, Türk Tarih Kurumu, 1954, p 600. Selânikî Mustafa Efendi, Tarih-i Selânikî (éd. Mehmet İpşirli), Istanbul, Edebiyat Fakültesi Basımevi, 1989, t. I, p. 44. Selânikî Mustafa Efendi, Tarih-i Selânikî (éd. Mehmet İpşirli), Istanbul, Edebiyat Fakültesi Basımevi, 1989, t. I, p. 45. Colin Imber, “Die Thronbesteitungen der osmanische Sultane”, in M. Steinicke, S. Weinfurter (dir. ), Investitur-und Krönungsrituale, Cologne-Weimar-Vienne, Böhlau Verlag, 2005, p. 291-303. Friedrich Giese, Die altosmanischen anonymen Chroniken, Breslau-Leipzig, Brockhaus, 1922-1925, p. 132. Selânikî Mustafa Efendi, Tarih-i Selânikî (éd. Mehmet İpşirli), Istanbul, Edebiyat Fakültesi Basımevi, 1989, t. I, p. 47. Gülrü Necipoğlu-Kafadar, “Dynastic Imprints on the Cityskape; the Collective Message of Imperial Funerary Mosque Complexes in Istanbul”, in J.-L. Bacqué-Grammont, A. Tibet (dir. ), Cimetières et traditions funéraires dans le monde islamique, Ankara, Türk tarih Kurumu, 1996, t. II, p. 23-36. Anthony Dolphin Alderson, The Structure of the Ottoman Dynasty, Oxford, The Clarendon Press, 1956. Halil İnalcık, “The Ottoman Succession and its Relation to the Turkish Concept of Sovereignty”, in H. İnalcık, The Middle East and the Balkans Under Ottoman Rule, Bloomington, Indiana University Press, 1993, p. 37-69. Leslie Peirce, The Imperial Harem ? Women and Sovereignty in the Ottoman Empire, Oxford, Oxford University Press, 1993. Jean-Paul Roux, La Mort chez les peuples altaïques anciens et médiévaux d’après les documents écrits, Paris, A. Maisonneuve, 1963. Nicolas Vatin, “Aux origines du pèlerinage à Eyüp des sultans ottomans”, Turcica, t. 27, 1995, p. 91-99. Nicolas Vatin, “Comment on garde un secret. Une note confidentielle du grand vizir Sokollu Mehmed Paşa en septembre 1566”, in E. Kermeli, O. Özel (dir. ), The Ottoman Empire. Myths, Realities and “Black Holes”. Contributions in Honour of Colin Imber, Istanbul, Isis, 306, p. 239-255. Nicolas Vatin, “Le corps du sultan ottoman”, Revue du Monde Musulman et Méditerranéen, n° 113-114 (Le corps et le sacré en Orient musulman, sous la direction de C. Mayeur-Jaouen et B. Heyberger), 2006, p. 213-227. Nicolas Vatin, “How to Date the Law of Fratricide: A Hypothesis”, in J. Dumas (dir. ), à paraître dans les collections de L’Orient-Institut Istanbul, Würzburg, Ergon Verlag. Nicolas Vatin, Gilles Veinstein, “La mort de Mehmed II (1481)”, in G. Veinstein (dir. ), Les Ottomans et la mort, Leyde, Brill, 1996, p. 187-206. Nicolas Vatin, Gilles Veinstein, “Les obsèques des sultans ottomans de Mehmed II à Ahmed Ier (1481-1616)”, in G. Veinstein (dir. ), Les Ottomans et la mort, Leyde, Brill, 1996, p. 207-243. Nicolas Vatin, Gilles Veinstein, Le Sérail ébranlé. Essai sur les morts, dépositions et avènements des sultans ottomans. xive-xixe siècle, Paris, Fayard, 2003. Anonymous chronicles : Friedrich Giese, Die altosmanischen anonymen Chroniken, Breslau-Leipzig, Brockhaus, 1922-1925. Feridun : Nicolas Vatin, Ferîdûn Bey. Les Plaisants secrets de la campagne de Szigetvár. Édition, traduction et commentaire des folios 1 à 147 du Nüzhetü-l-esrâri-l-ahbâr der sefer-i Sigetvâr (m. H 1339 de la bibliothèque du Musée de Topkapı Sarayı), Vienne-Berlin, Lit Verlag, 2011. Kemalpaşazade, Tevârih-i âl-i Osmân. Defter VII (éd. Şerafettin Turan), Ankara, Türk Tarih Kurumu, 1954. Selaniki: Selânikî Mustafa Efendi, Tarih-i Selânikî (éd. Mehmet İpşirli), Istanbul, Edebiyat Fakültesi Basımevi, 1989.